OPEN FIRE - My Preorder CD is here!! These are the CD tracks list. And I am just an "Insanely Crazy Fan", because I only guessed 16 of the songs correctly. See my song list, here. I'm not happy with the title... I could be an "Insanely Super Crazy Fan" or I think I can be a "Insanely Super Die Die Crazy Fan", if only I took the song list from 1998 album. I thought, since he already had "EVOLUTION Album" that had songs from "Revolution (1998)", "Wei Yi (2000)"
But anyway.. some songs really surprised me. Astrology and As Time Goes By are the 2 most shocking songs. I was really clueless that those 2 songs are included. I actually had some feeling that Selina duet and Jane Zhang duet will be included. And they were, so my guess could have been correct that it's for a business reason. I Can't Stop Loving You and Dream Again. Friend told me that those will be the Japanese version and I think so too, because Leehom put the English title of the songs. Can I wish that the Dream Again to be in English? Who are You Thinking of at this Moment. I loveeeeeeee this song so very very much. And I am extremely happy that Leehom included it. This is a gorgeous song with a gorgeous guitar play. I wonder why he never sang it alive. The song totally deserves more recognition. If I had guessed it from "Revolution" and "Wei Yi".. I would have added 5 correct guesses and that would make me an "Insanely Super Crazy Fan"
I love that you update your blog in English. 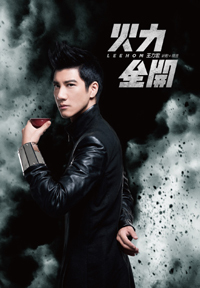 I can't read nor speak Chinese but I am a huge fan of Leehom. Thanks for reading my blog.. yeeaa I have this weird hobby of collecting any leehom things haha. Ni He Wo is one of my fave too. I got 16 songs corrected, if I didn't miscount it. And I'm ecstatic to find "I Can't Stop Loving You" is included. I need that obscure Japanese version. I deleted "Dream Again" from my list cause I really didn't think he would include any Japanese version, so I bet only on ICSLY. I was wrong. are the repackaged songs just the same with the old song or there any rearranged or remix?